The most effective way to catch trout at The Lakes is to use a sliding sinker rig and one of the prepared floating baits such as Eagle Claw Nitro Bait. The rig is very simple. Take a small egg-shaped sinker and slip it on your main fishing line. Tie the end of the line to a small barrel swivel (without a snap attached), and then tie on 18 to 24-inches of two- to four-pound test leader material to the other end of the swivel. It is best to use leader material is lighter in breaking strength than your regular fishing line. To the end of the leader, tie on a No. 16 or 18 treble hook. Mold a small ball of floating bait around the treble hook, just covering all of the hook points. Use as light a sinker and swivel as possible that will still allow you to cast a good distance from shore with your fishing gear. Using two- to four-pound test line on spinning tackle generally allows for longer casts and the use of 1/16 to 1/8th ounce egg sinkers. If you have six- or eight-pound test line on your reel, you can still use this rig with 1/4-ounce sinkers, but you need to use lighter leader (two- to four-pound test) material to attach to your swivel and hook. This same type of rigging can be used with an inflated nightcrawler, only you should use a size No. 6, 8 or 10 baitholder-style hook, depending on the size of your nightcrawlers. For “dillies” use the smaller No. 10 hook, while with regular nightcrawlers, the No. 6 or No. 8 sizes are better. The hook is placed lightly just under the skin through the collar on the bait. A worm inflator (available at most sporting goods stores with instructions for their use) is used to add air under the skin of the worm so that it floats up off the bottom. After casting out, this rig should be fished with an open bail on your spinning reel. Many anglers believe the bait should be kept in one spot so the trout can find it by sight and scent, while other anglers move the bait a foot or two per minute, working the bait back in slowly, and reopening the bail each time they move the bait. Very often the trout cruise at a certain depth, and by moving the bait, you can often fish where the fish are hanging out. Always keep the rod in your hands and as soon as the trout starts taking line, close the bail and set the hook in a single motion. Adding scents to all of these baits is not a bad idea. Nitro Gravy is a popular add-on, but there are dozens of others on the market, and many anglers simply douse their baits with garlic oil from the super market. All add-on scents serve two purposes — attracting the trout and masking the human scent that gets on the bait and hooks from your hands. There are two types of lures that are effective at The Lake. The in-line spinners like Roostertails and Panther Martins and the small jigs originally designed for crappie. The spinners are the easiest to fish. You can tie them directly to your fishing line or put a snap-swivel on the fishing line and then clip the lure into the snap. This also reduces line twist. In either case, you simply cast the lure out, allow it to sink near the bottom (if you start picking up weeks or get snagged, you’re fishing too deeply) and the simply reel it back in. Vary your speed to see which speed the trout prefer that day. Sometimes they prefer slowly-retrieved lures (this is especially true in cold water) and other times a lure that moves quickly gets their attention. If you see fishing breaking the water’s surface, begin retrieving as soon as the lure hits the water. The key to success is to experiment with speed and depth you fish the lure until you are successful. With spinners you can use heavier line than with the floating bait rig, but most anglers still do not recommend line heavier than six-pound test because it kills the action of the lure. Fishing small jigs requires more skill, more finesse. If fishing a spinner is like walking around the block, jig fishing is like doing the tango around the block. But once you learn the dance, you’ll be a big hit with the trout. Small jigs may be the most effective fishing lures or baits used at The Lakes. It seems like the smaller the jig you can fish, the more effective they are at catching the trout. Mini Jigs and Finger Jigs are two of the most popular brands, but there are many others. The 1/16-ounce size is the largest veteran jig fishermen recommend, and the 1/32- and 1/64th-ounce sizes get more play. Jigs this size almost mandate that you fish ultra-light line in the two- to four-pound test range. There are two primary ways to fish the small jigs. The most popular method is to tie the line directly to the jig, cast it out, allow it to sink to the desired depth (often the bottom), and then retrieve the lure in a dancing, bouncing motion. This can be done at a variety of speeds, but in each case the lure is popped up through in the water column with a snap of the wrist and then allowed to fall slowly back down. Then the jig is snapped up again, and then allowed to fall. The speed and depth is varied until you find what the fish prefer. The erratic motion of the jig attracts the trout. Fished this way, the small jigs actually look very much like a tiny, wounded minnow. The bigger trout that have been in the lake for more than a few days have started feeding on the lake’s natural shad and minnows and these jigs are a dinner bell for the trout, often enticing them when other methods fail. If the erratic motion doesn’t attract the trout, try a steady retrieve, but move your rod from side to side while reeling in the jig so it swims smoothly through the water but changes direction frequently. The second method used to fish jigs is with a bobber or float. You can use a variety of floats, but one of the most versatile method is to use a tiny, clear bubble float. This float is egg-shaped and has a plastic tube that runs through the center of the float. The tube can be pulled out and the float filled with water to give it more weight for casting. The fishing line is run through the tube and a jig tied to the end of the line. Many anglers add rubber “bobber stops” ahead of the jig and above the float on the main fishing line. The bobber stops catch at the bubble and prevent more line from moving through the float. This allows you to set minimum and maximum depths where the jig will be in the water. When this rig is cast out, the jig will sink either to the bottom or to the depth where you have placed a bobber stop. The bubble or float will remain on the surface when you cast, allowing you to fish a specific area precisely. Most anglers then simply twitch the jig ever so slightly to get it to dance up and down an inch or two. If this method doesn’t get the fishes attention, you can make the jig swim greater distances up toward the float and then fall back down. Often a cruising trout will rush over to a jig that rises up a foot or two in the water and then snap up the lure as it falls back toward the bottom. This is especially effective when the bottom has weed cover and the trout thinks the prey is escaping as it falls. These methods are very effective when trout are holding in a specific area or cruising along an edge or weed line and you want to keep the jig in that zone. The bubble float allows the jig to be danced more effectively and stay stationary in that zone better than small clip-on bobbers. Clip-on bobbers, however, are also effective. When the wind is ruffling the water, a simple clip-on bobber allows the jig to hang at the depth you set. The wave action makes the lure dance up and down, requiring almost no effort on the part of the angler. — Scents are essential. There are dozens of different fish attractants on the market, but most jig fishermen spray or dip their lures in scents like Nitro Grease. — Many of the better jig anglers at the lakes fish from a boat or float tube because they like using jigs too light to cast any distance, even with two-pound test line. The boat allows them to get out where the fish are cruising and they can use the boat to help play out line. The boat or tube also allows them to position themselves so the lure can be retrieved along weed lines or drop-offs instead of across them, as they most likely would do from shore. — There are times when anglers can see trout holding in deeper water, especially near where there is flowing water. Dancing a jig right in front of their nose, vertical jigging style from a boat or off the tip of a long rod from shore, will often result in a strike. — You can actually adjust how fast or slowly the jig falls through the water by varying both the weight of the jig and pound test of your line. Some regulars at The Lake carry jigs in several weights and sizes, and some even have spools filled with different line weights so they can experiment. — The rule of thumb is that the colder the water the smaller and slower you fish your jig. — The best jig color is white or pearl, but you should carry jigs in a variety of colors. Sometimes freshly-planted trout prefer bright colors — orange or chartreuse — and dark colors — black or brown — will often be the most productive on cloudy days or at dawn and dusk. — It is important that you use fresh line that is not frayed. Hooking an eight or 10+ pound trout is likely on a small jig at The Lakes, landing one that size on such light line requires a light touch and fresh line. Remember, good fishermen will usually always catch fish because they try different techniques throughout the day until they find the one which is working best. As conditions change throughout the day, so should your technique. Hopefully, this information should give any fisherman a good technical start. 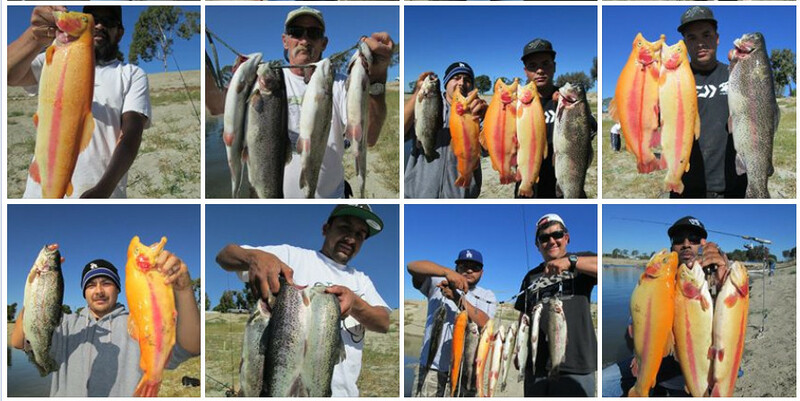 If you are not catching fish, try something different or move to a new spot. The fish are there, these Lakes are stocked with more fish than any other lakes around. Please be respectful to the other fishermen, and don’t take more than your limit.